Notes: From Devie Friedman, New Orleans, LA. This dish pairs nicely with Mumm Napa Brut Sparkling. Melt butter in heavy large skillet over medium-high heat. Add shallots and garlic and sauté until tender, about 4 minutes. Add shrimp and sauté 2 minutes. Transfer shrimp to a large bowl with a slotted spoon. Add white wine to skillet and boil until reduced to a glaze, about 5 minutes. Add drained diced tomatoes and prosciutto (if using). Simmer until slightly thickened, about 4 minutes. Add remaining ingredients and shrimp. Cook another 2-3 minutes until shrimp are heated through. Season with salt, pepper, and hot sauce. Serve over cheese grits. 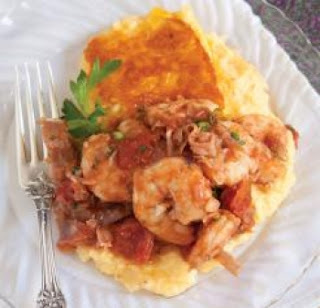 View recipe via Louisiana Cookin' (February 2012).